Harnessing the power of mass spectrometry to detect and quantitate proteins APAF conducts translational oncoproteomics in close collaboration with clinicians. Our objectives are to discover biomarker proteins useful for early diagnosis, prognosis and determining response to treatment in a range of cancers including colorectal, pancreatic, thyroid, prostate and melanoma. We are expert in the analysis of blood plasma and tumour specimens. Dementia, Alzheimer disease, motor neuron disease are research areas of interest to APAF and we have active collaborations with leading clinical and biomedical researchers in these disease areas. Dementia research supported by NHMRC Boosting Dementia Research Initiative and Motor Neuron Disease Research Institute Australia to investigating molecular underpinnings of this disease. APAF’s mass spectrometry platforms are supporting investigations to find diagnostic biomarkers and to understand mechanisms of activity associated with genetic mutations associated with motor neuron disease and frontotemporal dementia. 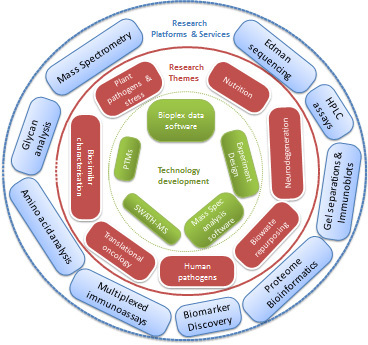 Our research is focused on integrating proteomic analysis with genome sequencing and phenotypic characterisation of bacterial pathogens to better understand how these organisms contribute towards disease. It is expected that such understanding will shed light of possible drug targets. In partnership with Sugar Research Australia APAF is applying its expert mass spectrometry and bioinformatics systems to investigate the biochemistry associated with sugarcane yellow canopy syndrome – a pathogenic infection that reduces crop yields. APAF is Australia’s leading research provider for amino acid analysis which is used to determine nutritional content of bioproducts such as foods. Our scientists collaborate with leading academic and industry researchers to investigate parameters that influence nutrient utilisation and digestion in animal diets. SWATH mass spectrometry is now widely used for proteomic comparisons. APAF is Australia’s leading provider of SWATH-MS services for research collaborations and has developed a suite of software workflows and tools to allow deeper proteomic characterisation. Access to SWATHXtend software is here. APAF uses the BioPlex Luminex reader to carryout multiplexed bead-based ELISA studies. Sample variance is minimised by using a liquid handling robot for sample manipulations. A key differentiator at APAF is our bioinformatics analysis of BioPlex datasets. We have demonstrated use of florescence values to increase detection sensitivity and expert bioinformaticians guide experimental design. We have begun a new research program with infrastructure funding from Cancer Institute NSW to evaluate therapeutic drug monitoring associated with some cancer therapeutics. A novel aspect of this research is the use of high resolution, accurate mass platform for analyte detection. Initial projects are examining levels of the prostate cancer drug abiraterone and various tyrosine kinase inhibitors in lung cancer. Drug levels will be correlated with clinical endpoints to examine pharmacokinetic relationships with ethnicity, polypharmacy, co-morbities. An extension of this project is a collaboration with ThermoFisher Scientific where we are evaluating use of paperspray mass spectrometry as a rapid manner to screen blood samples for these compounds.